Are you looking for a new show to binge on Netflix? Well guys, we’ve got you covered. No Good Nick premieres on April 15, and it’s definitely something you’ll wanna watch. The new show stars Melissa Joan Hart (you’ll probably recognize her from Sabrina the Teenage Witch), Sean Astin, Siena Agudong, Lauren Lindsey Donzis (she starred in Liv and Maddie!) and Kalama Epstein, and it looks like it’s going to be hilarious. What’s it about, you ask? Well, the comedy follows a family whose lives unfortunately get turned upside down when a mysterious girl shows up on their doorstep and claims to be a distant relative. Is she really related to them? What are her intentions? You’ll have to wait and find out! With a plot and a cast that epic, we already know we’re going to be hooked. And just when we thought we couldn’t get any more excited, we had the opportunity to speak to some of the cast members exclusively. They spilled all the tea on the show, and now we’re even more pumped! J-14: Do you remember where you were when you got your part? Siena Agudong: I was in an Uber leaving the audition when I found out I landed the role of Nick! I screamed so loud that the Uber driver got scared and swerved the car. It was funny. 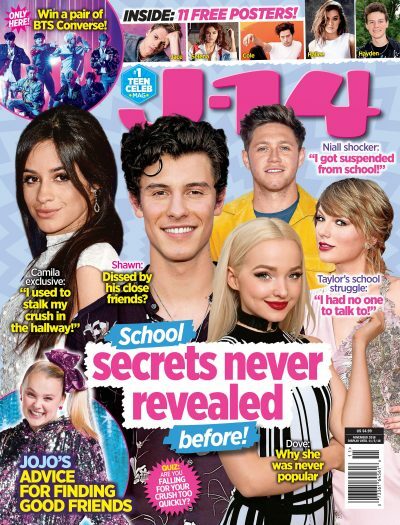 J-14: What’s a fun fact J-14‘ers might not know about the show? Kalama Epstein: We shot in front of a live studio audience on Friday nights! J-14: In your opinion, why’s NGN Netflix’s next binge-worthy sitcom? Lauren Lindsey Donzis: It’ll be binge-worthy not only because every episode ends with a cliffhanger, but because viewers will care about the characters, their relationships and their secrets. J-14: Who’s a celeb you’d love to have guest star at some point? Siena: Selena Gomez! She’s my idol. Make sure to check out No Good Nick on Netflix on April 15.